If your workshop has ceilings as high as [Niklas Roy]’s 3.6 meters (11.8 feet), then you’re familiar with his problem. Hot air rises, and there it usually stays until the heat is transferred outdoors. But in the winter time we need that heat indoors and down low. One solution is to install ceiling fans that blow that hot air back down. However, [Niklas] often builds tall things that would collide with those fans. And so he had to hack together some wall hugging fans which will be both high up and out of the way. For the fans he’s using six of those ubiquitous standing fans, the ones that normally sit on a post a few feet off the ground and swivel back and forth. Discarding the posts, he mounted the fan bodies to a horizontal wooden frame with a wheel attached to one end, one that he’d made for another project. A rope around the wheel, and hanging down, makes it easy to tilt the fans. For controlling the fans, a friend had given him an old industrial controller, and opening it up, all he saw was corrosion. Cleaning it all out he installed an old Russian 3-position switch from his collection. In the future he’d like to add a closed-loop control system that would not only turn the fans on and off but also adjusting their speed. For now, however, he reports that it works really well. Check out his page for build photos and more details. Meanwhile, winter really is coming to these northern latitudes and so here are more hacks to prepare you. For automated shovelling snow, how about an RC controlled 3D printed snow blower. And while you’re snug and warm inside remotely controlling your snow blower, you can still be getting exercise using a DIY bicycle roller. But if you do venture outside, perhaps you’d want to zip around on a dogless dog sleigh. The wheel goes round and round as does [Lou Wozniak]. 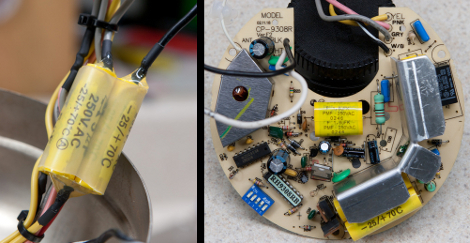 He’s come back to us, this time hacking together a pottery wheel from a cheap ceiling fan. This is a great use for a discarded or inexpensive fan and the build should cost less than $50. As you watch the video you learn that repurposing the ceiling fan was no simple feat. Lucky for us [Lou] spins through detailed construction procedures and doesn’t fail to cover every tip and trick. He really does think outside the box or should we say inside the bucket and peanut butter jar. The fan gets dismantled as well as rewired inside a 5 gallon bucket which is used as the pottery wheel housing and stand. 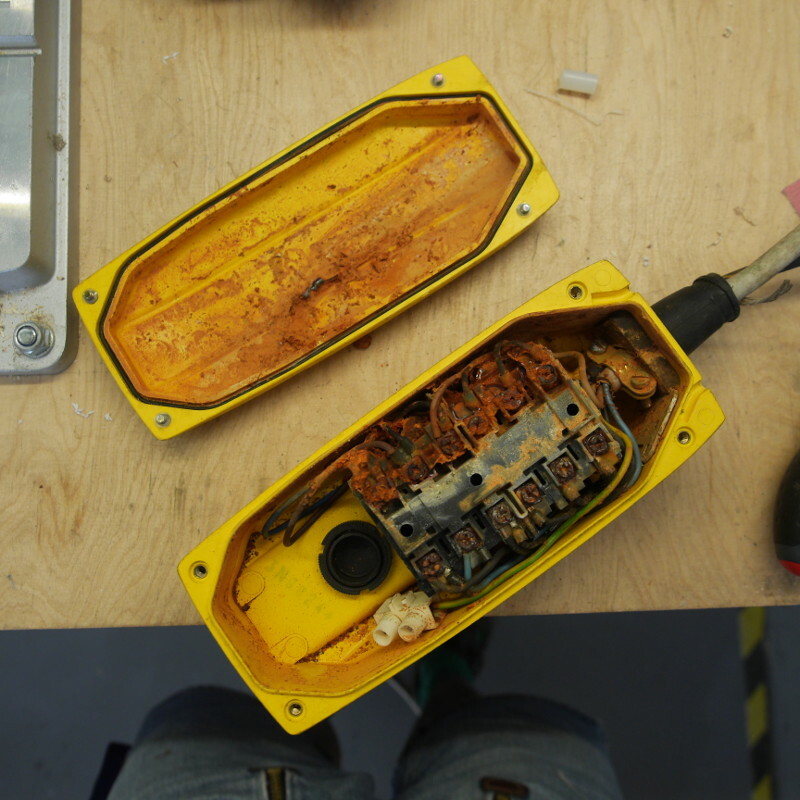 A plastic peanut butter jar was used as a makeshift electrical junction box inside the bucket. He remounted the motor’s string operated speed switch on the side of the jar and routed the pull string out the side of the bucket. The fan motor should have three or four switch speed settings which might be enough control. If continuous variable speed control is desired he could add in a controller similar to [Ben Krasnow’s] AC controller using one pin on a microcontroller. UPDATE: [AKA the A] tells us in a comment below that this controller won’t work with a ceiling fan, but we still really like [Ben’s] project so we’re leaving this link here. Most potters use significant amounts of water to wet the clay while they throw, so we have reservations about having the high voltages and open motor design directly under the wheel with no shielding. We know [Lou] could easily hack in a splash pan and of course always plug into a ground fault protected receptacle when using electrical appliances around water. We do get to see the wheel in operation at the end of the video, which you can watch after the break. However, [Lou] makes no claims at being a pottery artisan. Bullet time has been around since at least the first Matrix movie (actually there was a Gap ad before that), and despite it being an oft-used cinematic technique, it still hasn’t gotten old. [Jeremiah] wanted to tap into the awesomeness of bullet time, and managed to come up with a great camera rig using only a GoPro and a ceiling fan. The build really relies on only two components: a GoPro camera and a ceiling fan. In [Jeremiah]’s videos, a ceiling fan is mounted between two trees on a sturdy piece of lumber. The GoPro is suspended from one of the fan blades with the help of a piece of wood, a hinge, and a short bit of cable. After [Jeremiah] wired up the fan to a dimmer switch he could control the speed of the fan and Bob’s your uncle. This isn’t the first time a GoPro has been used for a bullet time rig. In fact, our buddy [Caleb] did a similar build by spinning the camera around on a lazy suzan. Gotta love the high frame rate available on the GoPro, huh? The ceiling fan in [Steve Vigneau’s] bedroom started giving him trouble. It is normally operated using a remote control but that functionality had become pretty spotty. He cleaned the contacts on the remote but still had troubles that could only be fixed by power-cycling the fan itself. When it finally died he set out to repair the unit himself. Above you can see the controller board from the fan. It was a bit too complicated for [Steve] to troubleshoot so he figured why not just stop using the remote control and make it work with a couple of switches? A bit of research led him to some basic fan schematics that he used for a reference. He need to remove a couple of capacitors and wire them up with one switch for the fan and another for the light. Sure, there’s no settings for speed or direction, but [Steve] thinks he doesn’t need to change them and always has the option to add them in the future.